|Our newcomer innovations are designed to help immigrant families settle into Canadian society. The inclusion of Canada’s immigrants in mainstream society is crucial, both for the quality of life for newcomers and for the development of our society. Newcomers, many times, face barriers upon arrival including poor English language skills and the lack of a social network to support and encourage them. Many arrive knowing very little about the day-to-day workings of Canadian life; workings that most of us take for granted. How to enroll and prepare a child for school. How the parent-teacher relationship works. How to apply for a job. How and where to vote. How to get a library card. Our newcomer innovations are designed to help immigrant families settle into Canadian society. For the newcomer parent, the Home Visitor is a link to mainstream society. She is a source of information. She knows how to enroll a child in school, how to get a library card, where to take an ESL course. The relationship between the parent and the Home Visitor develops over one to three years. It’s strong. It’s built on trust. And it’s built on understanding, as most Home Visitors were also parents in our programs. As newcomer families move through the program (s), English language skills improve and their social networks expand. Parents not only learn to teach their children, they inevitably become more confident and, therefore, more comfortable to give and voice their opinions and ideas in the classroom, the lunchroom, the living room, any room they may venture into as they journey through life. Most importantly, they make friends and create a sense of belonging – a place for themselves in their new homeland. The Mothers Matter Centre and its partners’ research, design, test and evaluate the feasibility of social innovations to ensure the well-being, dignity, and social connections of high-risk vulnerable mothers. Social innovations seek to redress ongoing structural barriers isolated newcomer and refugee women confront when attempting to access settlement services. We are committed to developing program innovations pertaining to housing assistance, job-skills training, literacy and language training, healthcare, and more. Government Assisted Refugee (GAR) women and children are among the most victimized and vulnerable newcomers to Canada and too frequently arrive struggling with the impact of severe trauma that prolongs and frustrates their settlement process. Reviving Hope and Home is a project between the Mothers Matter Centre and Immigration Society Services of BC that will test the feasibility of a social innovation to ensure well-being, dignity, and social connections of high-risk, vulnerable GAR mothers. The current HIPPY program will be adapted to provide diverse, integrated settlement supports to ensure a holistic, seamless assistance from arrival to settlement. 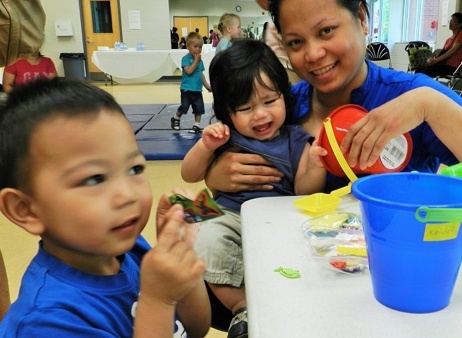 The HIPPY Program and ELL combines the HIPPY program with language instruction for isolated immigrant and refugee mothers who have low-level English skills but do not find the typical English Language program accessible. The program consists of four essential components that include: in-home language learning opportunities, neighbourhood-based group language learning approaches, language assessments, and the delivery of the HIPPY program. The program’s primary beneficiaries are highly isolated newcomer and refugee mothers with extremely low literacy levels who are less likely to participate in community programming because of their income, cultural practices, number of children, and language fluency.